Yes, even the soil in shady areas can vary – hot, dry shade to cool, moist shade. 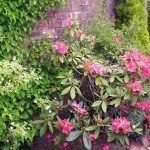 Once you’ve carefully considered both light and soil requirements for your shaded area, finding suitable shade-loving plants is easy, especially in the border. 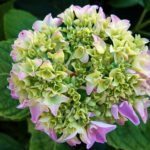 When it comes to foliage plants, don’t be afraid to integrate every color of green into your shade border, using bright greens to the darkest olive greens. Light-colored leaves, variegated foliage, or those with cream or white margins illuminate the shade border while medium tones are neutral, easing the transition between contrasting colors. You can use bluish-green foliage to create depth, making small borders appear larger. The dark, olive green foliage can provide a nice backdrop for the lighter, brighter foliage and blooms. Repeat color combinations that you like throughout the shade border. This will unify the space and create a sense of movement. Different leaf textures and forms add interest to the shade border. For instance, placing small, delicate, fern-like foliage next to larger, round-leaved forms create dramatic visual effects in the shade border. Include some dwarf conifers in your shade border. Smaller, upright coniferous forms not only add further interest to the shade border but also height. Hydrangea and Azalea – No shade border could be complete without a hydrangea. This shade-loving shrub can help provide structure to the shade border, as will other shade-loving shrubs like azaleas. Caladium – Caladiums dazzle in shade borders with their large, arrow-shaped leaves splashed with shades of green, white, cream, pink and red. Grouped together, they can make quite a statement. These plants look exceptional paired with other shade lovers. Hosta – Nothing is more graceful in the shade border than the hosta. Numerous varieties of this foliage plant are widely available, ranging from the lightest of greens to blue, and with nearly any conceivable variegation of green, gold, cream and white. Astilbe – The soft, colorful plumes of astilbe are great for creating contrast in the shade border. Coral Bells – For show-stopping color in the shade border, coral bells are also a great choice. Coral bells thrive in part to full shade, forming low mounds of foliage with spikes of delicate, bell-shaped blooms. Hellebore – Hellebores are ideal for the shade border too. There are endless choices for shade borders, and with just the slightest bit of imagination and the right mix of plants, you can create a show-stopping shade border filled with vibrant colors and unique interest year round. 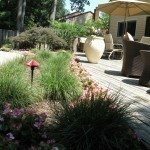 Read more articles about Shade Gardens.